Dr. Phillip Sprangle received his doctorate in applied physics from Cornell University. His research covers a wide range of fields and includes the atmospheric propagation of high-energy lasers, ultra-short pulse laser matter interaction and propagation, nonlinear optics, free electron lasers, nonlinear plasma physics and laser driven accelerators. He is a Fellow of the American Physical Society, the Optical Society of America, the Institute of Electrical and Electronics Engineers, and the Directed Energy Professional Society. 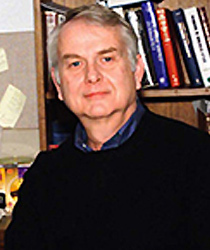 He has won numerous national and international awards for his research, including the IEEE Plasma Science Award (2008), International Free Electron Laser Prize (1991), E. O. Hulburt Science and Engineering Award (1986), the Sigma Xi Pure Science Award (1994), two Technology Transfer Awards, the Top Navy Scientist and Engineer of the Year Award (2008), as well as the 2012 Office of Naval Research Dr. Fred E. Saalfeld Award for Outstanding Lifetime Achievement in Science. Dr. Sprangle retains a partial position at the Naval Research Laboratory, where he serves as a Senior Scientist for Directed Energy Physics. A. James Clark School of Engineering professor recognized for pioneering contributions in plasma physics.